According to LME data on December 31, there remains one dominant warrant holding position currently holding 50-79% of total zinc stocks. LME zinc stocks are at their lowest since 2008. On the face of it, its almost impossible to imagine that this is not a prima facie case of market manipulation. Despite the lowest level of physical since 2008,futures are trending lower because of trading derivatives. We have seen it for years in the silver market, where there COT report shows ten years of physical silver production being transferred in derivatives in a single day. LONDON Ã¢â‚¬â€œ Expectations of a supply avalanche hitting the nickel market next year due to new capacity in Indonesia have sent prices to seven-month lows, but analysts doubt the plans spearheaded by Chinese firms can be carried out so quickly. 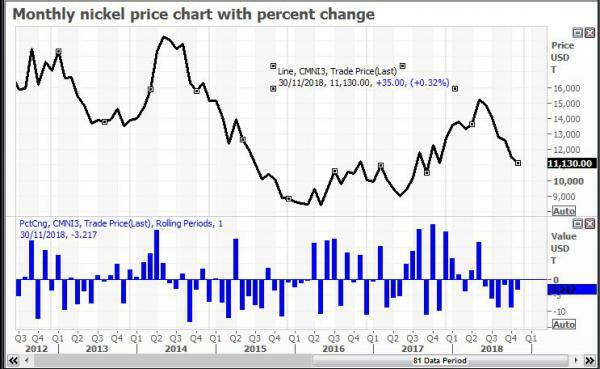 Benchmark nickel on the London Metal Exchange nearing $11,000 a tonne is down more than 15 percent since late September, partly due to the U.S.-China trade dispute undermining demand for the metal used in stainless steel. Nickel is also vital for the lithium-ion batteries used to power electric vehicles, where demand is set to accelerate exponentially over coming years. 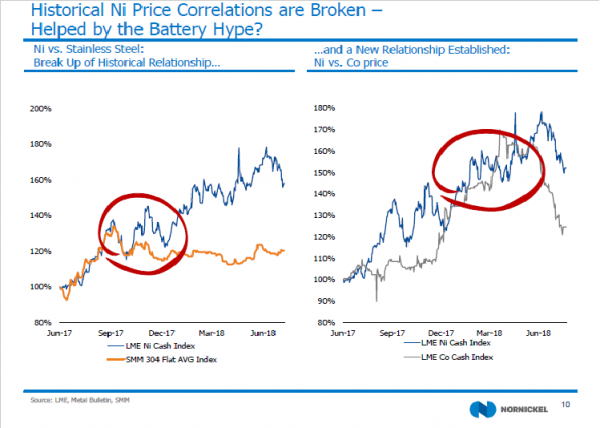 This is why companies in China, which dominates electric vehicle battery production, need to secure nickel supplies. That includes GEM, which recently announced it was teaming up with Contemporary Amperex Technology (CATL) and Tsingshan Holding Group to invest $700 million in an Indonesian project to produce battery-grade nickel chemicals. Also involved is Japanese trading house Hanwa, which in a release said production would start in 2019. The consortium aims to establish a 50,000-tonne high-pressure acid leach (HPAL) facility at Tsingshan's industrial park in Morowali, on the Indonesian island of Sulawesi, to produce nickel and cobalt chemicals. "There is panic about supply, but the Tsingshan project isn't going to hit the market next year. It will take two to three years," said Jim Lennon, managing director of Red Door Research. GEM, CATL and Tsingshan did not respond to requests for comment. A source at one of the Chinese partners said construction may start at the end of 2019 after a site had been selected and the equipment ordered and delivered, but that the date may be pushed back to 2020. "What also spooked everybody was that they said it was going to cost $700 million," Lennon said. "Pretty much every HPAL project has taken longer and cost more than was originally announced." One example analysts cite is Ambatovy in Madagascar. On its website, Ambatovy says the project cost $8 billion and will have capacity to produce 60,000 tonnes of nickel. LONDON, Oct 19 (Reuters) Ã¢â‚¬â€œ The bulk of nickel moving out of London Metal Exchange-approved warehouses in Asia is showing up in hidden facilities in Europe, analysts said, denting a bullish scenario of potential shortages. BEIJING, Sept 28 (Reuters) Ã¢â‚¬â€œ Chinese battery firm GEM Co Ltd on Friday said it was teaming up with four companies to invest a total of $700 million in a project to produce battery-grade nickel chemicals in Indonesia. The investment comes as several global metals producers have also set their sights on Indonesia's nickel reserves, looking to tap an expected surge in demand for the battery metal from the electric vehicle sector. They aim to establish nickel smelting capacity of at least 50,000 tonnes per year at Tsingshan's industrial park in Morowali on the Indonesian island of Sulawesi. "In the future, the product structure will be adjusted according to the global market demand and the production scale will be expanded," GEM said in an emailed statement, without providing a launch date. 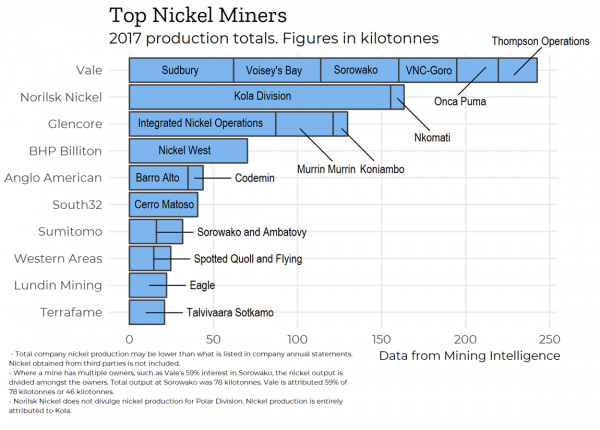 Nickel Mines ((NIC)) could become a significant operator in the global nickel industry. The catalyst, Bell Potter believes, is a collaboration and subscription agreement with Tsingshan, the world's largest stainless steel producer. Tsingshan operates a fully integrated stainless steel facility in the Indonesian Morowali Industrial Park. Via this agreement, Nickel Mines has applied US$70m of its IPO funds to lift ownership of two rotary kiln electric furnace lines at the park to 60% from 25%. This paves the way for equity production of 10,000tpa of nickel in nickel pig iron in 2019. These production lines are well advanced with commissioning on track for the June quarter of 2019. Bell Potter believes Nickel Mines represents a compelling opportunity to gain exposure to low-risk, low-cost nickel production. The broker initiates coverage with a Speculative Buy rating and $0.45 target, suggesting the stock is a rare exposure to strengthening nickel market fundamentals as one of only a handful of listed, pure nickel plays worldwide. Raised $200mill . Chinese, Wijoya Family shareholders, Indonesian mine.